If you are new to the principle of Desired State Configuration (DSC), its Big Idea is to take a set of declarative instructions (basically configuration as code), and if the requested thing is not in the required state, “make it so”. If it is in the required state, do nothing. This article uses the simple example of folder creation to demonstrate that. Everything happens locally, which is not a typical use-case, but is useful for focussing on learning and basic syntax, rather than also getting your head around remoting. Sometimes rather than struggle with remote authentication, I am happy just to push a bunch of scripts to a new VM, and do everything locally. You still need WinRM running. For the example, I am creating a folder. 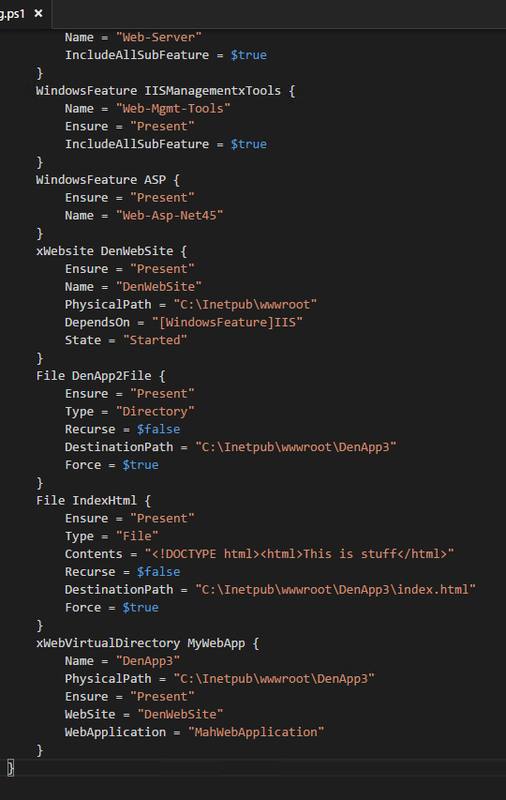 (Of course it is very easy to create a folder in “normal” PowerShell or from the command line or any number of ways. But this is precisely about using the very simplest example to illustrate a point.) The push server and the receiving client are the same thing. 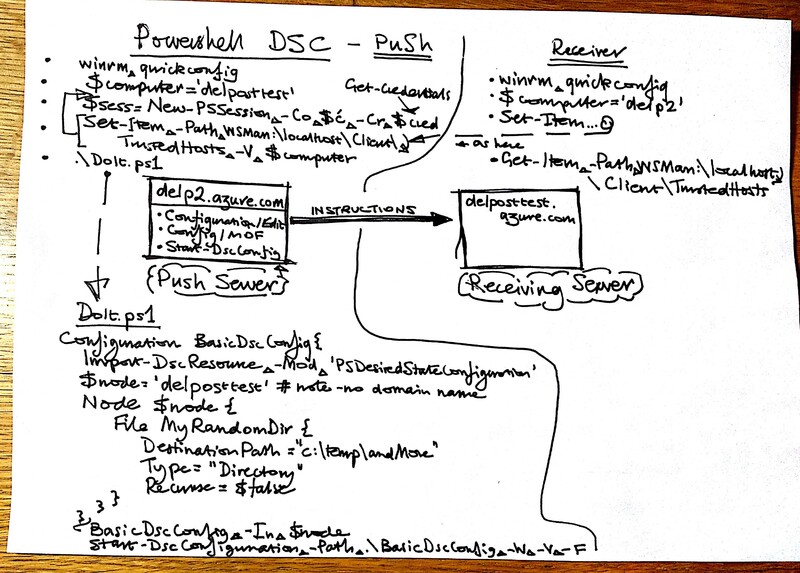 This example can be executed on a Windows 7 client (providing it has the right level of PowerShell for DSC*) or Windows 10 client, or Windows 2012 R2 server and up. *The minimum version of PowerShell is 4.0. 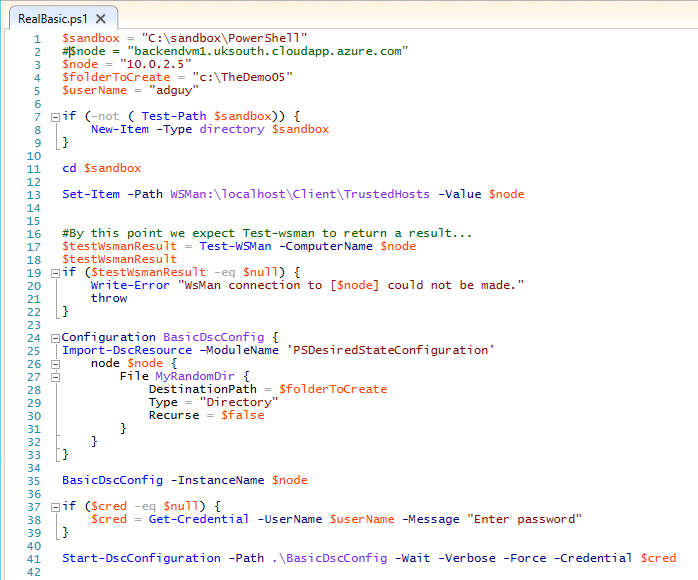 You can check this by running $psversiontable in Powershell. The related file/directory is: c:\temp\TheDemo01. The destination object was found and no action is required. Both of these were expected, as you might hope with something called Desired State Configuration. This is starting to feel a little more robust in my mind… I created a pair of VMs on Azure, on the same subnet, with 1 implicitly a push server, and 1 a “client” server, or “pushee”. Each have public IPs… although thinking about it could I just have opened the RDP ports without that? Don’t know, don’t think so. But regardless they talk DSC to each other through their respective private ports. In fact I couldn’t actually get them to talk DSC/PowerShell/WsMan to each other through their public ports/DNS names. Authentication is done through runtime credentials… which are the same on both servers, FWIW. I don’t have a domain (uksouth.cloudapp.azure.com not really a domain… and if it was that would worry me from a security point of view. The test here was to create a folder from one to the other, being the very simplest proof that had value… and it worked. Advice: after each failed run, delete the created Dsc configuration folder. Avoids confusion. What it says… however I am finding in Windows 10 that while no error is thrown, the icon does not take. Yet in Windows Server 2012 R2, it does appear. The single code file and the history is in a Gist here. I started out with an Azure VM (WS 2012 R2, SQLServer 2016). My aim was to deploy a web application so that the index.html was visible to the external world. Additions I did not yet manage to achieve in DSC were a) adding endpoints for http and https in ARM, b) setting up self-signed certificates on the host VM. The http part right now is a Must.. the https might be considered optional but sensible. That already highlights one new thing: The UK now has its own Azure data centres… previously I noticed I would often get my browser language in Dutch. There seems to be no “Let it be so” option for an existing virtual directory… so might have to replace that with some imperative code. This was driving me absolutely nuts. 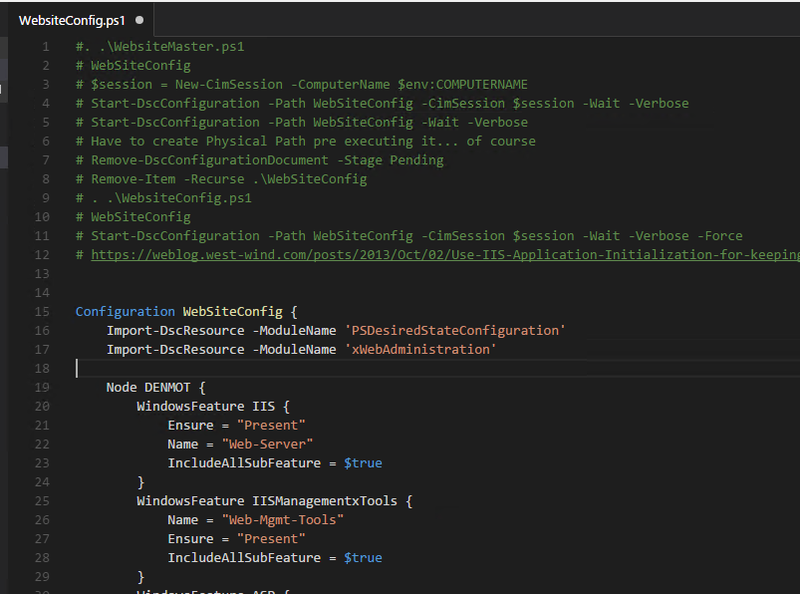 A helpful post pointed me at [C:\Windows\System32\Configuration], and get rid of the pending.mof file. But that didn’t help. Now I can get on with the original goal.